Ms. Maxine Herbert turned 102 this week. Her birthday was on Monday. 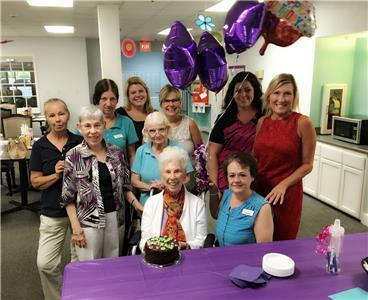 She celebrated with a birthday party with her family and friends at East Ridge Residence in Chattanooga. She was asked about her advice on life after having lived more than 100 years. Ultimately, she has no regrets of things she has done or hasn’t done. Ms. Herbert was born on Aug. 6, 1916, in Michigan and mainly grew up in Lansing. After her son and daughter retired to Tennessee, she moved as well to be closer to them. She was married to her first husband for 27 years. He was a devout Catholic and since Maxine had no religious affiliation, they eloped. Occasionally, she would go to church with him to listen to the organ music. A year after her first husband passed, she met and married her second husband. When he retired as a schoolteacher, they flew to Europe, bought a car and traveled all over the country for a year. Ms Herbert shared that she was blessed with two wonderful husbands.